Is 55 the new 45—feet, that is? In much the same way that advances in healthcare have allowed us to feel younger than our years, technological innovations in sailhandling gear and mechanical propulsion have made yachts 50 to 60 feet long a breeze to sail, dock or anchor, even for sailors whose ages are approaching that of their boats’ LOA. Jennifer Stewart of Berthon USA in Newport, Rhode Island, which represents Moody and Contest, agrees, attributing the growth in this size range to a change in attitude on the part of the older buyers who can afford to spend $1 to $2.5 million to buy one. “We’re fit,” she says, “and more able to handle a larger yacht.” Not that you necessarily need to spend a million-plus to buy into this size range: you can also get into a fully-specced Beneteau, Jeanneau, Hanse or Bavaria for much less than that. Although most new launches in this size range vary from 54 to 57 feet LOA, we’re going to call them 55s for the sake of brevity. Following current design trends, many of these boats have a plumb stem—or nearly so—and a short overhang aft. The extended waterline reduces pitching, which allows the sails to produce more drive and provides an easier motion at sea. This, in turn, helps keep the crew safe and comfortable, and allows for a better night’s sleep on passage. A long waterline on a given LOA also provides the yacht with more stowage space, larger staterooms (or more of them), a truly useful galley and many of the other comforts taken for granted ashore. The Hanse 575, Gunfleet 58 and Moody DS54 are all good examples of how this concept works both practically and aesthetically. Every sailor knows that arriving at a destination is far less important than the joy of voyaging toward it, but I’ll wager most also believe that fast is more entertaining than slow. That’s another thing the new breed of 55s offers: a combination of that same long waterline length and reasonably light displacement, which laughs at the traditional speed/length ratio of 1.34 to 1.40. A large, easily trimmed and reefed sailplan also allows a shorthanded crew the luxury of adjusting the boat’s speed and angle of heel to suit its needs. When it’s time to cook, for example, you simply back off the power, reduce the heeling angle and motion, and head for the galley. Even the more traditional designs in this size range are a long way from being stodgy or passé. Hallberg-Rassy’s new 55, for example, is a classic center-cockpit passagemaker that flaunts her Swedish heritage and conservative styling. Her overhangs are moderate, so she doesn’t have the racy look that’s all the rage nowadays; she gets her interior volume from a relatively deep underbody and generous beam; and the cabintrunk extends forward of and abaft the cockpit to add to the feeling of spaciousness below. 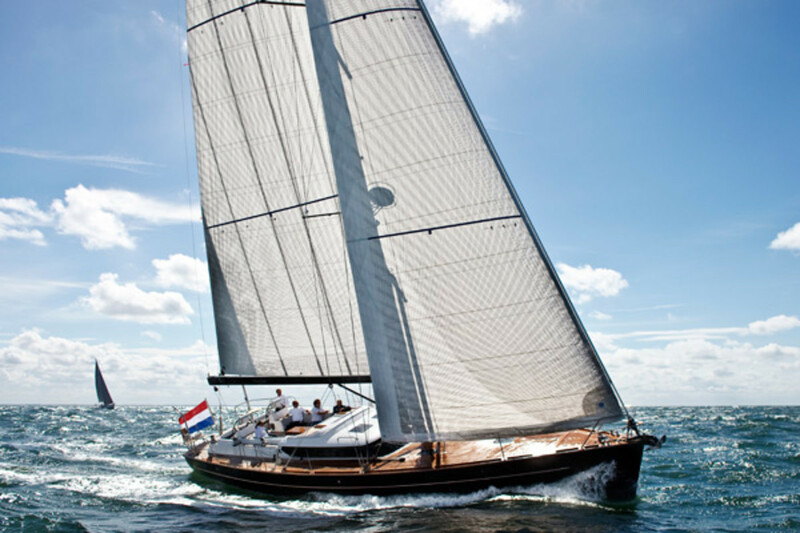 Nonetheless, she still offers excellent performance, whether on a daysail or on passage. Anyone who’s been to a sailboat show recently surely has noticed that the 55s have more freeboard and taller superstructures than was common even 15 years ago. The usual assumption that an increase in freeboard adds to a yacht’s volume belowdecks is accurate. However, that extra acreage has also encouraged builders to put large windows in the topsides, increasing natural light and the feeling of spaciousness inside. From a practical point of view, lots of freeboard also lets designers raise the overhead in the engine compartment and machinery spaces. The Discovery 57, for example, has a genuine walk-in engine room. Now you have no excuse for ignoring your auxiliary, gen set, air-conditioning compressor or the watermaker. In fact, many modern 55s have enough space in the stern for a bona fide garage, so that the tender will be out of the way, safe and sound, but still easy to launch and retrieve. 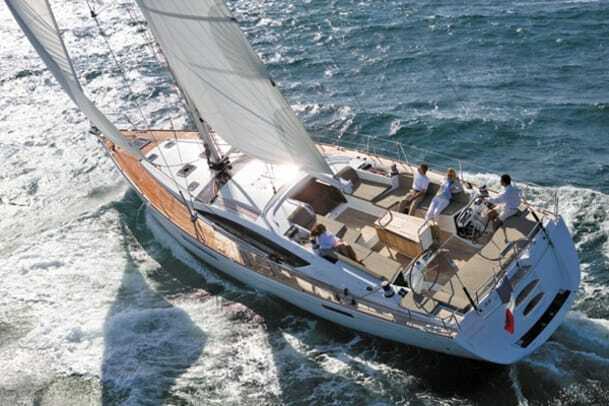 For example, a garage is standard aboard the Hanse 575, as it is with the Bavaria 56, and it doesn’t interfere with any of the arrangement plans. The brand-new XP 55 from X-Yachts (set to be launched early this summer) also has a garage as standard. The tender sits athwartships, spanning the yacht’s beamy stern, so it won’t interfere with the accommodations. By contrast, a dinghy garage is an option on Southerly’s 57RS. Here the standard layout calls for a master stateroom all the way aft, a VIP cabin at the bow and a guest cabin on the starboard side opposite the galley; choosing the garage splits the space aft into two cabins, relegating the master stateroom to the bows. Similarly, the other more traditional yachts in this category, including the Oyster 575, the Hallberg-Rassy 55 and the Amel 55, all have davits on the stern. Whatever the case—davits or garage—the size of the boat determines how large the tender can be. Many of the 55s sport a sleek deckhouse, often resembling the roofline of a high-performance coupe from Jaguar or Aston Martin. These low-profile structures house the raised, or “deck,” saloon and are kept slippery-looking by the substantial freeboard, which masks the coachroof’s height. You’ll not only find more than enough headroom inside, you’ll be able to see out of the large windows even when you’re seated. The DS54 is one of several yachts that maintain a single level from the main bulkhead to the transom. The twin helms on these boats also allow unobstructed passage to the swim platform, with an eye toward making the boat as friendly as a beachside cottage when at anchor. I feel safe in saying that Oyster Marine popularized the modern deck saloon, which helped make the company’s 53 and 55 so popular back in the middle 1980s. The configuration remains popular among dedicated Oyster fans and continues to attract new devotees via the used-yacht market. In a recent world rally, eight of these models joined the fleet. In 2011, Oyster unveiled the 575 as a logical development of these earlier boats. A year later, the company further upgraded the boat’s styling, taking cues from the Oyster 625. A flowing coachroof brings the look up to date, but still provides a spacious well-lit saloon. Lannigan adds that whether it be a deck saloon or pilothouse, these types of structures typically don’t work very well on boats shorter than 55 feet, as they often look like an afterthought on a smaller superstructure. Yachts in the 55 to 60 feet LOA range generally have enough space belowdecks for one or two paid crew. Moody offers the option of a captain’s quarters in the forepeak in two layouts of its DS54. Similarly, the Amel 55 has a snug single stateroom on the starboard side amidships opposite the engine room and immediately abaft the nav station, which could be a captain’s quarters—same for one of the optional arrangements in the Contest 57CS and the Hallberg-Rassy 55. ?This, however, is another area in which there’s room for multiple opinions. “Why would you want paid crew in a 55?” Lannigan asks. She’s convinced that these boats are too small and easy to run to need a captain.